It was a picnic. Of all things to throw me over the edge today, I must admit to it being a picnic. We had decided last night that, it being an evening without extra classes, we should use tonight to pack and picnic and head to a city park supposedly lovely with spring blooms right now. I should have known better than to plan our outing for the day of the week that never fails to use up every ounce of my work energies: this year the Wednesday schedule simply maxes me out so far as the number and combination of classes. I also should have known better than to make the plan for a week in which I am extra short on help with library maintenance tasks. I especially should have been wary of any extra adventures in the week of a pending decision I need to make: a huge, many-years-impacting decision. I am perched at precipice, peering into the doorway of a dream come true . . . but a dream that stretches the limits of my confidence. Quite frankly, I do not know if I can do it, never mind if it is wise for us to commit to the expenses [spanning multiple sorts of “costs”] of it. So it was that I came to the end of the day spent. So much so that a simple request to teach an extra class tonight brought me to a teary-eyed “No—I cannot: not tonight!” I texted P as I got on my bike to tell him I was on my way home. I also warned him, adding that “I don’t know if I can go out—I think I may need to stay home tonight.” I didn’t wait for his response before starting out . . . I knew I didn’t need to. I am married to a man with infinitely more patience and understanding than I can generally muster myself. I didn’t need to wait for the “No problem” that was to come. Nearing home, I was getting back onto the bike after walking through a doorway when I paused. Out of the corner of my eye, I saw a flash of blue on the ground. Though I do not normally take time to pause at this point in the day, I did. 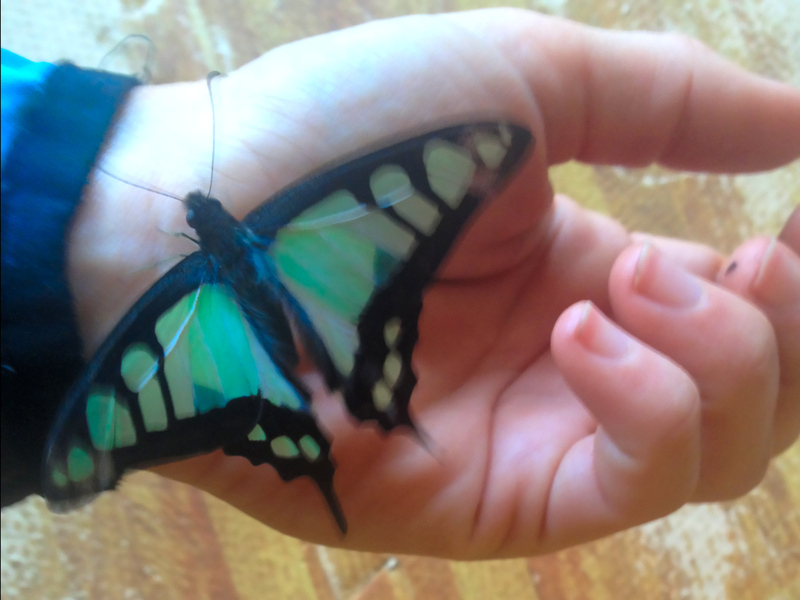 Others walked around me as I then bent down and cupped a stunning butterfly in my hands. I do not know why I had the impulse to do so, but as it crawled along, limping from some sort of likely-fatal injury, I wanted to bring it home. P met me at the door and started to move my bike for me but I stopped him. “Wait—I need to do something!” I pointed to the bike basket, and to what was flitting about inside it. We cupped it together in our hands and snapped a photo of it before releasing it again. I do not have high hopes for the future of this butterfly life . . . but I do have hope. Perhaps the same can be said for my own.